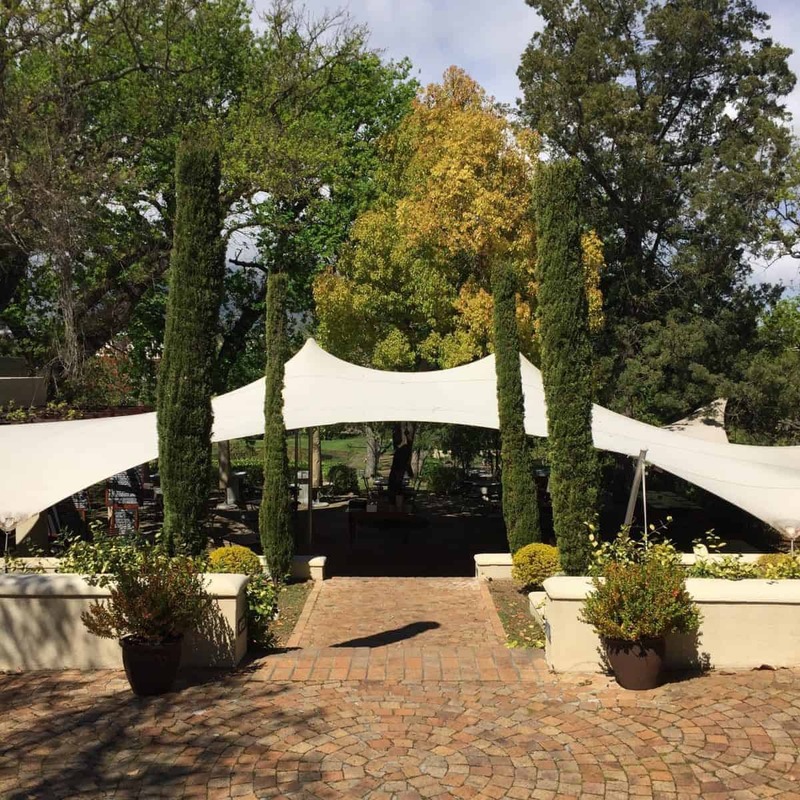 Terroir Restaurant is located in Stellenbosch on the Kleine Zalze wine estate. 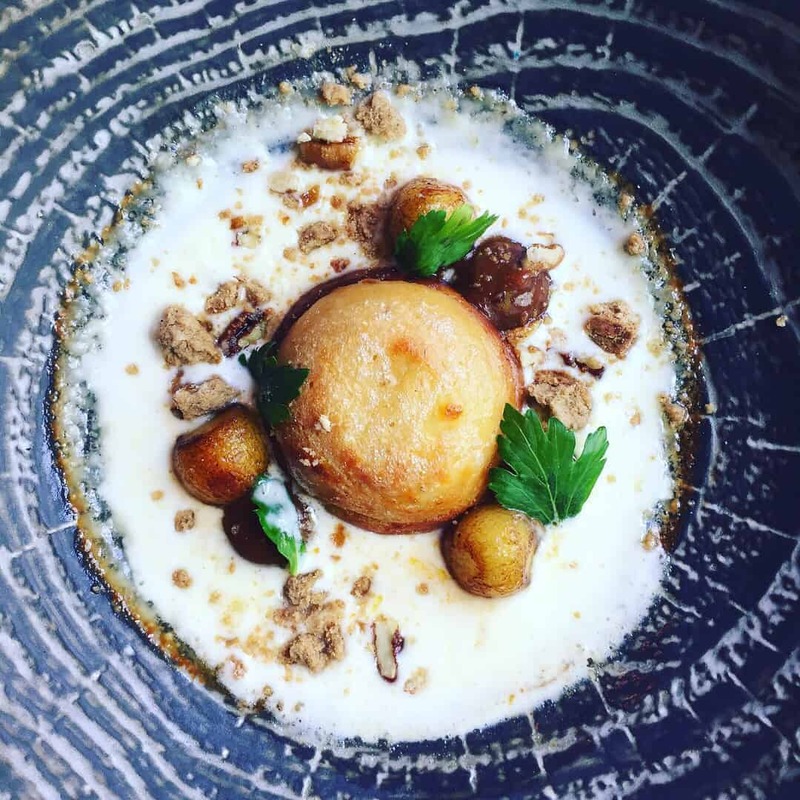 It was opened in October 2004 and has certainly built up a reputation for itself on the South African culinary map, along with the Kleine Zalze award-winning wines – a perfect combination. The name ‘Terroir’ means soil or agriculture which is very much in line with their style of food – fresh and from the earth. 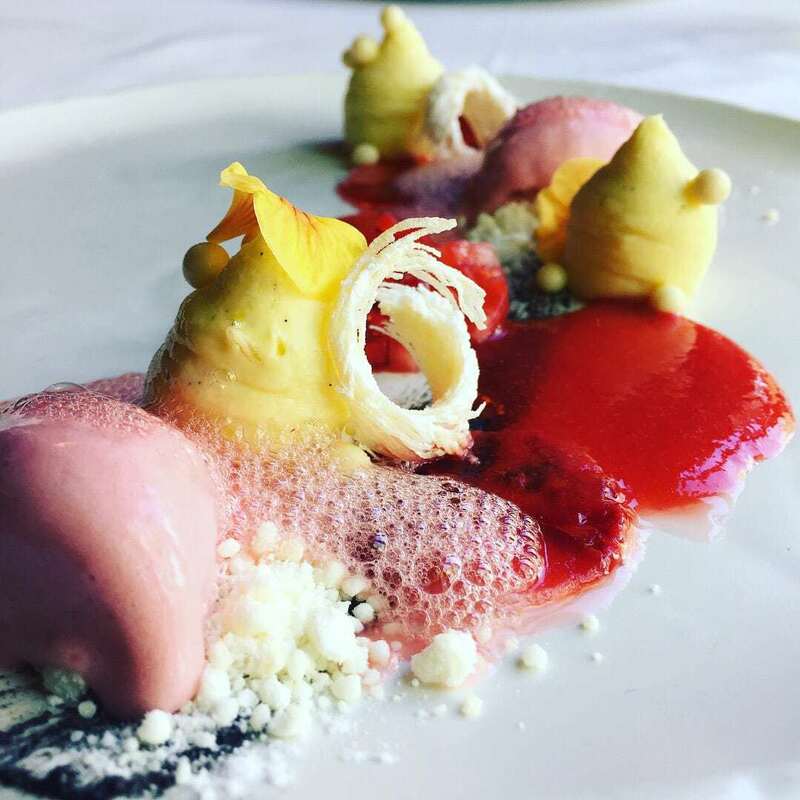 The dishes Chef Michael Broughton has created are truely exquisite – some of the most beautiful creations and taste sensations I have ever experienced! Definiteley well worth a visit in my opinion. 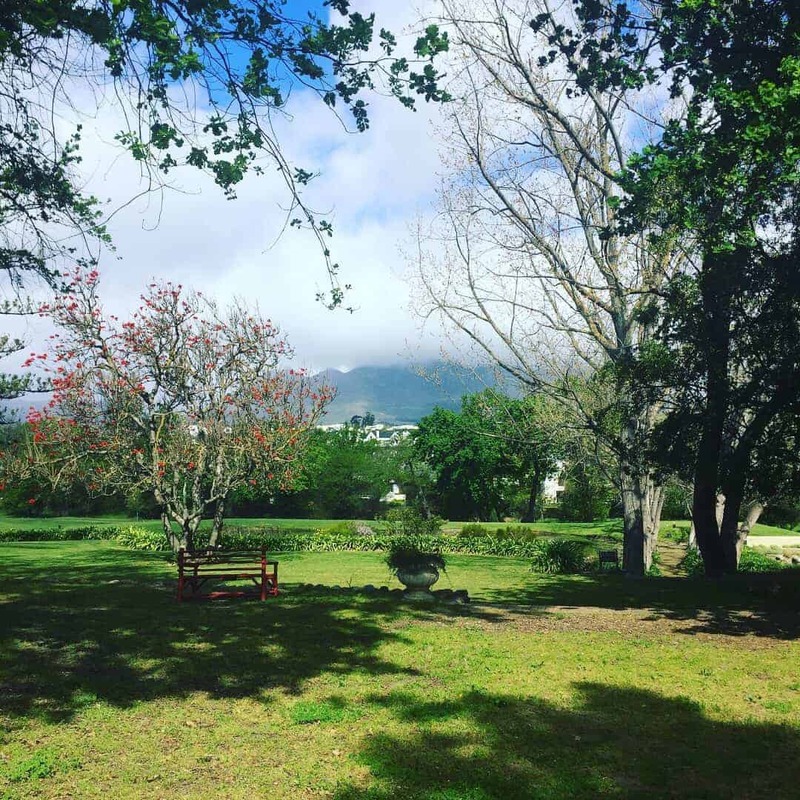 The location is spectacular – surrounded by mountains, rolling lawns and hills. The restaurant has an outside section which is very relaxed and would be amazing on a sunny day, however, we sat inside due to it being a little chilly. I must say the interior could do with a bit of an update, although it was very clean and classic in style. We were welcomed by a lovely glass of the Kleine Zalze MCC Brut and an antipasto board with olives, fresh bread and butters. Our waitress was delightful and had been working there for over eight years! We opted for the tasting menu which meant we could each try 2 different starters, a main and a dessert each. The quantities for the tasting menu were perfect and I am glad we made that choice. 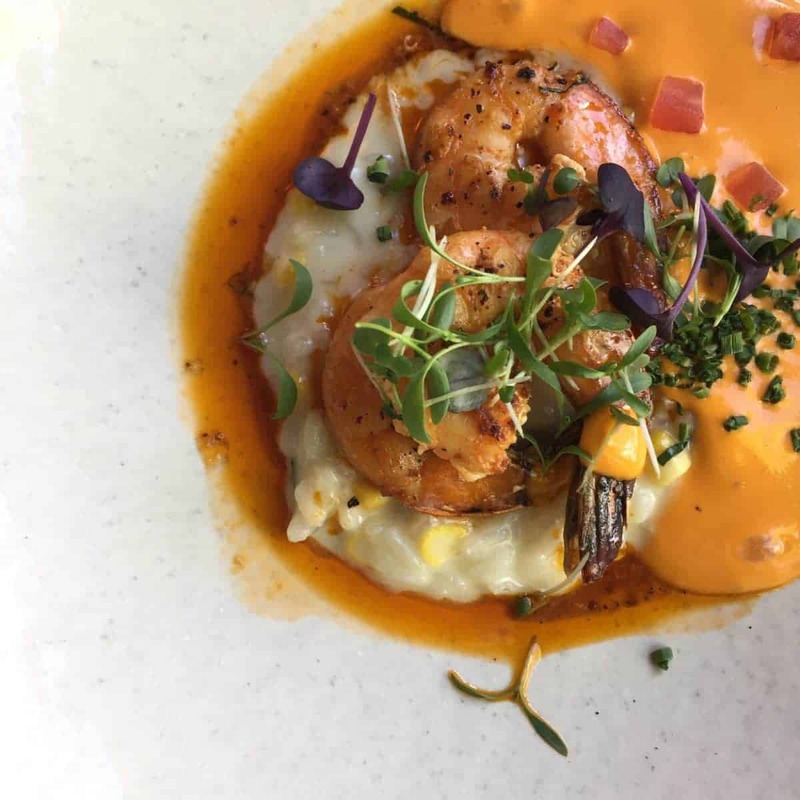 Corn and basil risotto, with Prawns and an Américaine sauce – this flavour combination was right up my alley, I wouldn’t say it was ‘out of this world’ or a surprise combination, but just a really beautifully cooked and flavourful dish. This was paired with their Barrel Fermented Chardonnay and I really enjoyed this – good start to the meal! The salmon was incredibly fresh and paired with the Cellar Selection Sauvignon Blanc. All the elements of this dish had been individually prepared in a unique way which made it really interesting. The soufflé – this was another of my personal favourites! Melt-in-your-mouth with the stilton coming through rather subtly, and the parmesan being more prominent, but definitely well balanced in terms of taste. I loved the various textures in this dish and thought the ginger crumbs were a great addition to round off the dish and make it a little different. This was paired with the Kleine Zalze Family Sauvignon Blanc. 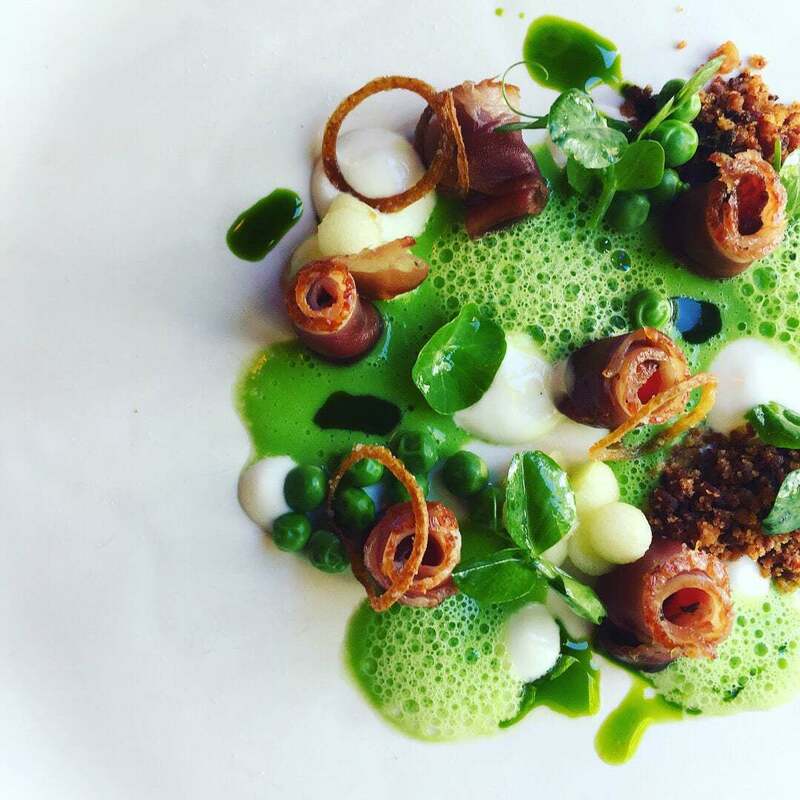 The show-stopper: smoked duck breast served with pea and truffle velouté, nasturtium and mint oil, peas, pickled apple and chorizo crumble. The presentation of this dish was very impressive! 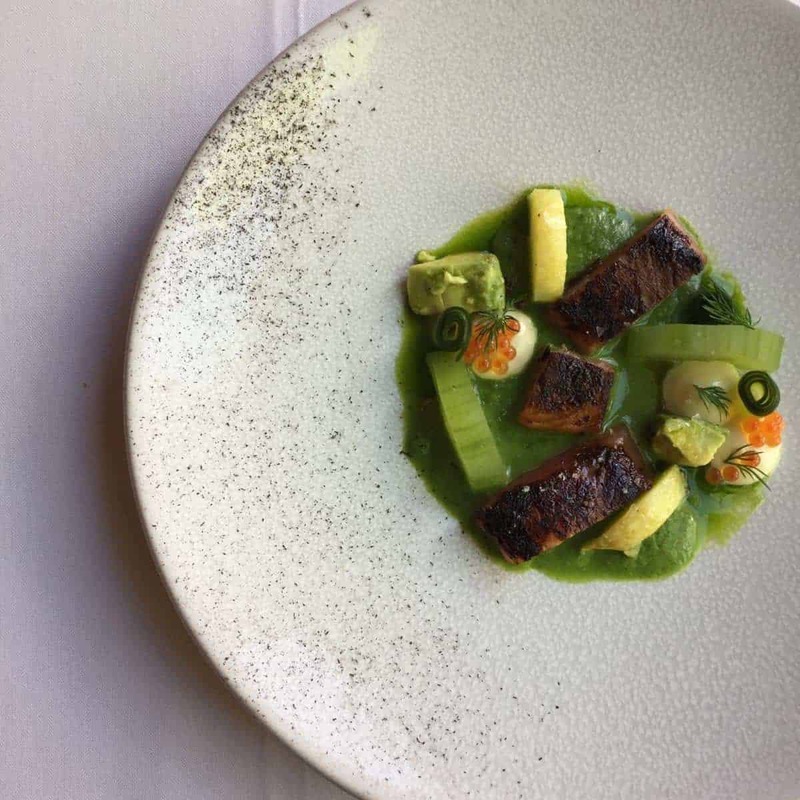 A lot of detail and thought must have been put in to create the visual appeal of this dish, perfectly paired with the 2016 Kleine Zalze Barrel Chardonnay. 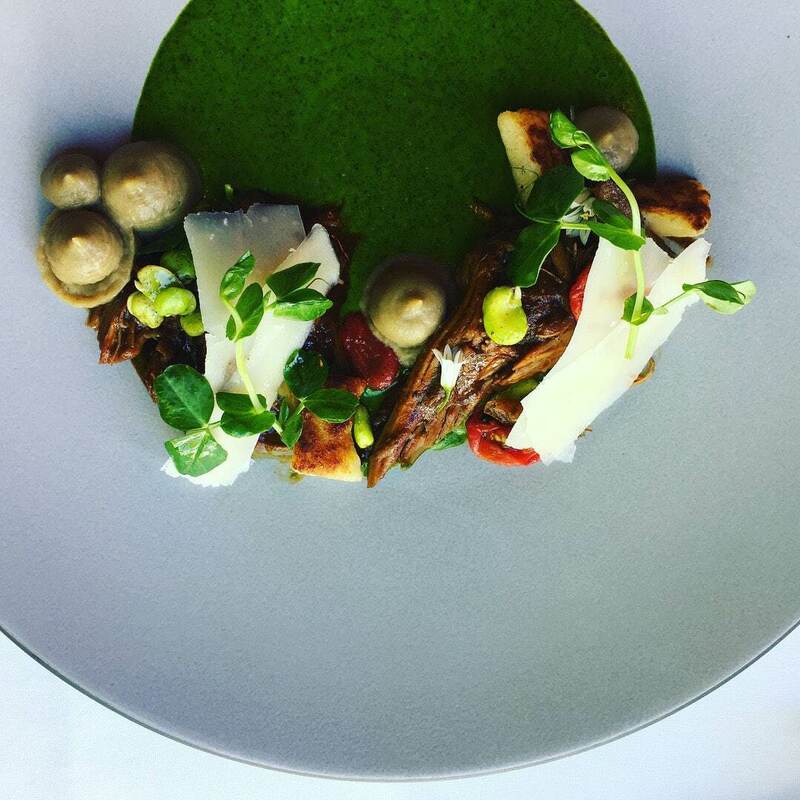 We had the braised lamb shoulder with watercress cream, celeriac gnocchi, Jerusalem artichoke purée and Parmesan, paired with the 2015 Kleine Zalze Cabernet Sauvignon. The presentation of this dish was also amazing and quite a taste sensation too – the meat was rich and full of flavour and the other components worked very well with it. 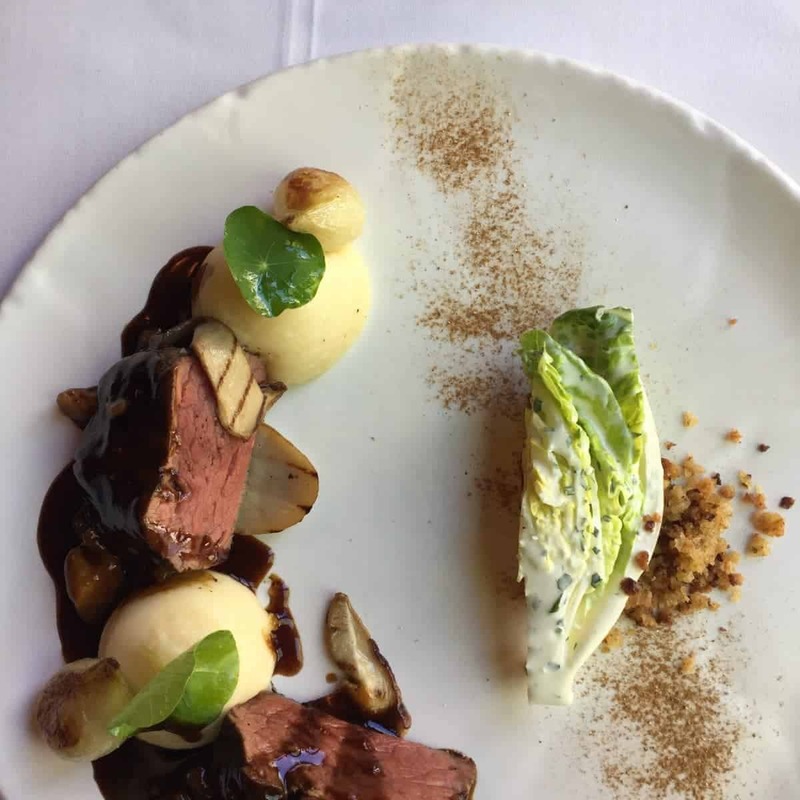 The other main we chose was the Grain-fed Karan beef fillet with porcini mushroom, aligot, baby gem lettuce, Bordelaise sauce and ranch dressing paired with the 2015 Kleine Zalze Shiraz. When I read the description for this dish I thought it sounded a little complicated with too many strong flavours, but this was not the case at all. The meat was cooked to perfection and we really enjoyed it. The dessert selection was great, with a variety of the more ‘expected’ desserts (ice cream, sorbet, cheese plate) as well as some more interesting ones – of which we selected. We had the Strawberries with black sesame and white chocolate crumble, paired with the Stellenrust Chenin d’ Muscat. The strawberries were prepared in a few different ways, along with the additional textures and tastes from the other elements – a really wonderful dessert to end off a great meal! The other dessert we chose was the Mille-feuille with kiwi sorbet, also paired with the Stellenrust Chenin d’ Muscat. A stunning combination of pastry layered with chocolate, salted caramel, caramelized banana, cream and nuts and then the very refreshing kiwi sorbet to go with it – delicious! 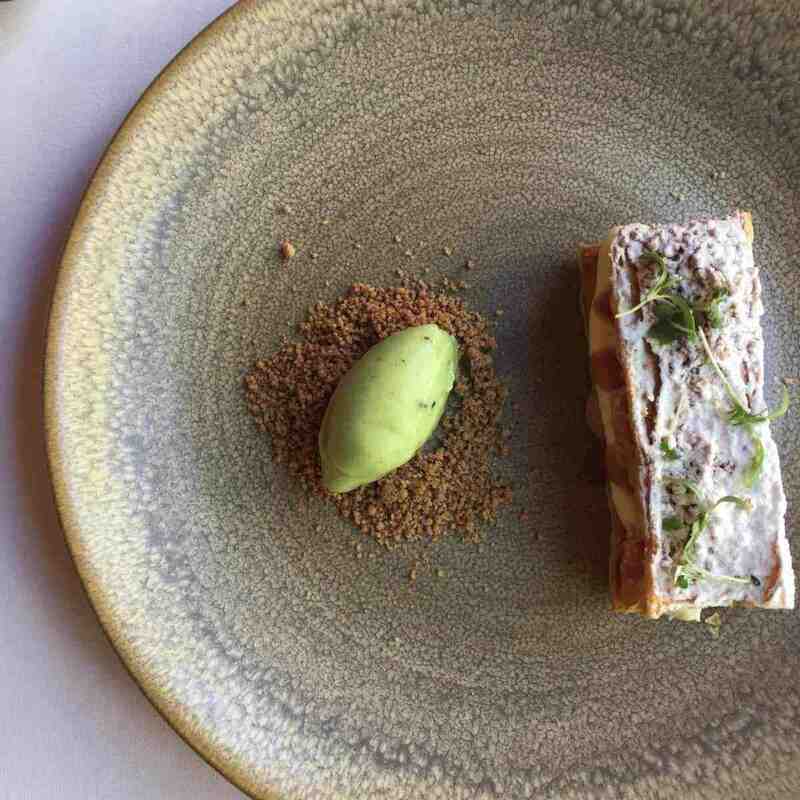 If you are looking for a relaxed lunch or dinner, with amazing food and you appreciate food presentation, friendly and professional staff then I suggest you book a table at Terroir (you may need to do so in advance to avoid disappointment).